First European Men Having Babies Surrogacy Seminar and Expo is scheduled for April 29-30, 2012 - Part of four-day LGBT families gathering in Barcelona, Spain. We are happy to announce "Men Having Babies - Europe" at the Second European Conference of the Network of European LGBT Family Associations (NELFA). 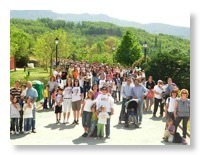 It will take place on April 29-30, 2012, as part of a 4 day conference near Barcelona, Spain, which is expected to attract 700-800 people, including both parents and parents-to-be. The parenting seminar and expo is offered based on a similar program that has been running in NY for the last seven years. The elaborate program will include a comprehensive surrogacy seminar on Sunday (April 29), and a Gay Parenting Services Exhibit. In addition, at least eight leading agencies and clinics from the United States and Europe will hold hour-long presentations on Sunday afternoon and Monday 11:30-17:30. Among the topics are ethical surrogacy practices, international surrogacy laws, know vs. anonymous egg donations, and speaking to surrogacy kids about their origin. Prospective parents and LGBT family activists will also have opportunities to learn about service providers at the Conference's four day Parenting Resources Display. The Sunday program is also open to prospective parents who may not otherwise take part in the 4-day conference.